Ruthanne Burgard fell in love with Polish pottery while living in Germany for a couple of years. “I use it every day and thought it would be fun to have a store dedicated to it,” she said. 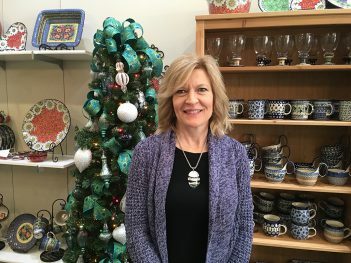 So in 2006, she opened Out of the Blue Polish Pottery & Gifts in Monticello, Ill.
She decided to open her second store in Carmel City Center. The store opened Sept. 19 at 727 Hanover Place, Suite 149. An official ribbon cutting was held Oct. 30. Burgard has an apartment in Carmel and is traveling between the two stores but spends most of her time in Carmel. The stores feature hand-painted stoneware from factories in the small village of Boleslawiec, Poland. Burgard travels to Boleslawiec each year to view what is new in the pottery factories. Artisans hand paint each piece using a sponge stamping technique that can take up to three hours to paint. All of the pottery is oven, microwave and dishwasher safe. Burgard has a booth at Carmel’s Christkindlmarkt. It features ornaments and Christmas patterns on the pottery pieces. The store is open Tuesday through Friday from 10 a.m. to 6 p.m. and Saturday 10 a.m. to 4 p.m. Burgard said she expects to extend the hours around the holidays.